Bismuth is a heavy metal similar to lead and arsenic, but not nearly as toxic. It is found naturally in very small amounts in some foods and its sulfide and oxide compounds are important for use in cosmetics and medicines. Bismuth is not available as a supplement because it is not essential to your body. 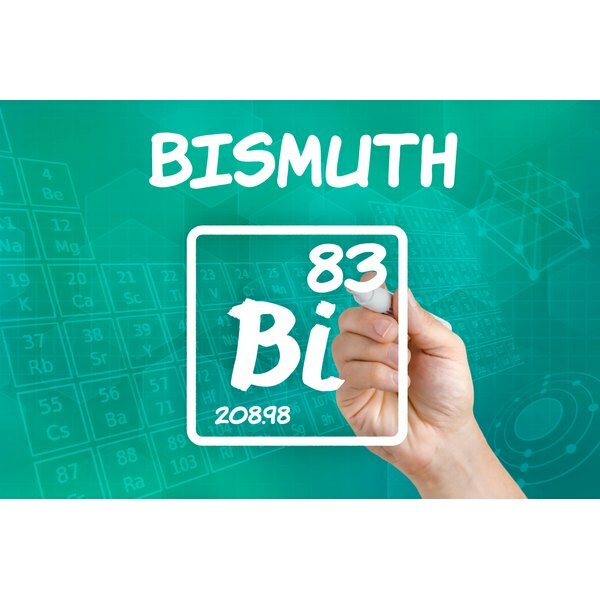 Bismuth doesn’t provide any nutritional benefits directly, although it can be of help with gastrointestinal disorders, which is why it is used in brand-name products such as Pepto-Bismol and Kaopectate. Consuming too much bismuth can lead to side effects, so consult with your doctor before using it. As a metal, bismuth was known in ancient times, but often confused with lead, tin and antimony. Bismuth is derived from the German language and means “white mass.” It is a naturally occurring and stable heavy metal and about 86 percent as dense as lead, but much less toxic, which is why alloys of bismuth are now used as replacements for products that have traditionally been made from lead, such as buckshot. Bismuth compounds were once used to treat syphilis, but are now better known as gastrointestinal remedies. Bismuth is absorbent and reduces acidity, which is why it is used in medicines for stomach upset, heartburn, diarrhea and some gastrointestinal diseases, such as peptic ulcers, according to the “Compendium of Pharmaceuticals and Specialties.” Specifically, bismuth subsalicylate is used as an anti-diarrheal and is the main ingredient in Pepto-Bismol and Kaopectate. Bibrocathol is another bismuth compound used to treat infections of the eye. Devrom contains bismuth and is used to reduce odor in the bowels. Although the half-life of bismuth is generally short for most of your tissues, it can accumulate in your kidneys and liver with long-term use, causing toxicity symptoms and reduced function, according to “Human Biochemistry and Disease” by Gerald Litwack. Too much bismuth leads to a dark colored tongue, black deposits within the gums of your mouth and black stools, which are similar symptoms to lead poisoning. Skin and respiratory irritation can also occur following exposure.